February and March continued to be both challenging months: Symptom central and yet more doctors appointments. It also saw the start of my new fundraising campaign for this on-going and madly expensive medical treatment. March brought around my first A&E trip of 2015… I had huge reservations about going, as from previous experiences I know there’s never much they can do to help me. They have no understanding of this disease nor the impact that it has had on my body. I always get approached the same response as I tell my story and get passed around the various nurses and doctors… “What’s Lyme Disease? How do you spell that like the fruit?” I can’t blame the individuals specifically as it’s not their fault that they have not been educated sufficiently about this disease, but never the less its ridiculous and wrong that they are not taught about this matter. Some medical professionals have been introduced to the basics but unfortunately, this has been taught using old research, inaccurate testing methods and the UK’s Lyme treatment guidelines, which are flawed like a book with too many missing pages. The vital bits of information are no-where to be seen, you only get half the story and there doesn’t seem to be a final closing chapter. As a patient you are left with a cliff hanger, not sure of where to turn or who you can trust, not knowing how your story will end. I began to accept the fact that I was not going to get any help in the UK, but at times you have no choice but to visit the GP, especially when symptoms spiral out of control and you just simply need help. 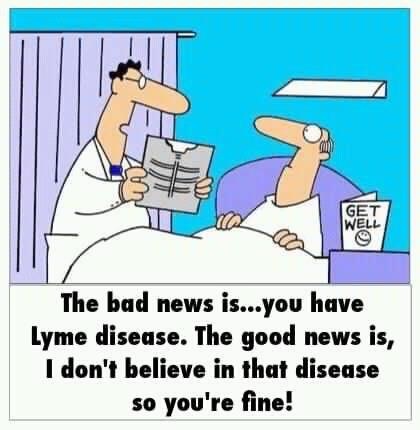 When this happens I am never able to see the same doctor, so once again I have to begin by filling them in on the last few years of my life with Lyme and of course I am expected to do this in a 5 minute appointment slot! An experience this time round I see yet another unfamiliar Doctor, the clock is ticking, and they are looking as baffled as always. They continue to look at both me and their computer screen even more confused than ever…They have no idea why my skin has turned a bright shade of red and stinging like I have been burnt. They finish up by telling me that they have lost my blood tests for the third time and that they still won’t be able to give me any of the medication I need. I get frustrated, more emotional and I feel like I am almost begging for help and I am once again disappointed. The painful burning skin episode! A&E proved a similarly destructive experience, causing more stress than comfort and I was still non the wiser to why a sudden increase in pain. I try and avoid going to hospital at all costs, especially at 10pm on a weekend. After developing a surge of chest pains and strange heart palpitations, I thought it best to be safe than sorry. Complications of Lyme Disease include heart problems such as Tachycardia and Myocarditis, so I just wasn’t prepared to take the risk. I had both my bloods taken and an ECG performed. It didn’t come back completely normal, but due to their limited knowledge in Lyme I was just told I wasn’t having a heart attack so I was safe to go home. I also randomly got told by a doctor at the hospital that “I look too well to have Pneumonia”, bearing in mind I didn’t go in there with symptoms of this nor ever thinking this could be a possibility! It proved to be yet another insightful experience I would rather forget, and I finally crawled into bed at 4am exhausted and still having chest pains! As some of you reading this may already know I have had to re-launch a new fundraiser for continuing treatment in the USA. Thanks to such a supportive network of family and friends who contributed to my initial fundraising page, I was able to travel to a specialised clinic in California for almost 4 months. There I received further diagnostic testing and intensive medical treatment, from which I made noticeable progress. My treatment is on-going, with both oral antibiotics and herbal supplements, of which I am still self funding. I have already spent £30,000 – £35,000 on medical tests, treatments and my first trip to the USA clinic. I have seen so many physical and neurological signs of improvement throughout the past year, but there has been a recent plateau in my progress. This fundraiser is allowing me to return to the clinic and continue with ’round 2’ of intensive medical treatment, which is vitally important for my recovery from this debilitating illness. The NHS continue to have severe difficulty understanding or treating this disease and without the intravenous antibiotics and supportive treatment therapies readily available to me in the UK, my recovery is compromised greatly. I am so determined to fight this disease and with the help of donations and the Lyme literate doctors in the USA, I really do have a great chance, not to mention hope. Treatment is a long and gruelling process, but I keep in mind the end goal of becoming symptom free and with a prognosis of remission. I am still very much in need of donations to enable me to stay in the US and receive medical treatment and continue to ship oral medication to me once I arrive home in the UK. If you are able to help in any way this would be hugely appreciated, no donation is too small. Now I am back in the US I will be sure to update you all soon with my treatment plan, progress and how things are going state side. This first few weeks has been a tough transition and the medication is hitting hard, so unfortunately I haven’t been up to spending much time on my computer, but I will do soon, promise! Lots to tell you all about my adventures in the ‘Lyme Light’!